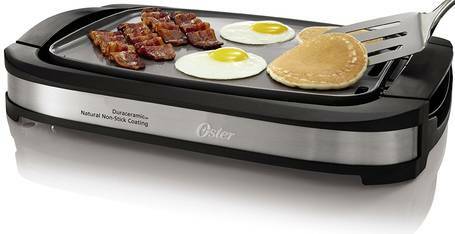 The Oster DuraCeramic griddle is in the upper price range for a counter top electric griddle. It's a stylish and large sized electric griddle with advanced ceramic non-stick surface. The heating element and plate is a smart design that lifts out and can be flipped over. One side is flat, the other is ridged and designed to drain unhealthy fats and grease away from the food and into a full-width drip tray below. Oster's DuraCeramic coating is advertised as lasting 4 times longer than conventional nonstick coatings. It's made without harmful chemical additives, and tough enough to withstand higher temperatures and metal utensils that could warp and damage softer coatings. It resists sticking and requires minimal or no cooking oil or spray. The 18 by 10 inch double-sided ceramic cooking plate is coated with a natural coating that's PFOA and PTFE free, perfectly safe for contact with raw meat and eggs. One side is smooth and level, ideal for grilling pancakes and eggs. The reverse is ridged to allow fats and grease to drain away below the food, drain through the holes in one end and collect in the drip tray beneath. Cool touch side handles are attached on the sides of the ceramic plate, and fit neatly into the base unit so the whole plate can be safely lifted out of the base, clear of the metal drip tray which can then be removed, emptied and cleaned. Power comes from a 120V AC mains lead which connects to a rotary temperature control attached to one side of the Oster electric griddle. This whole unit with the temperature probe detaches to make the base and tray immersible in soapy water for easy cleaning. Buyers appreciated the full sized drip pan and the ability to finish cooking before having to empty an overflowing tray as with many smaller griddles. The ceramic surface means it can heat hotter (to 450 degrees) than metal plates, and can be used with metal utensils with less risk of scratching or chipping. Many owners appreciated the quality of the ceramic coating, for the ability to cook without oil for the health benefits and ease of cleaning. A quick rinse in soapy water was sufficient to remove most cooking residues. The ridged side of the cooking surface received some praise for its design: any excess liquids and grease would drain away, but the plate would retain enough fat to brown pancakes or cook bacon in its own fat. It's pricier than many competitors. A lot to pay just to cook breakfast, some could say. The ceramic plates took a long time to reach temperature. The removable, reversible plate leaves a gap around the edge. Fat and grease (and, for one cook, eggs) can find their way through the gap and onto the base unit and counter. A few owners struggled with badly-fitting power cables, and plugs that began to work loose and fall out. Many of them were able to obtain a replacement part under the one-year limited warranty, but there seems to be a design flaw in this area. 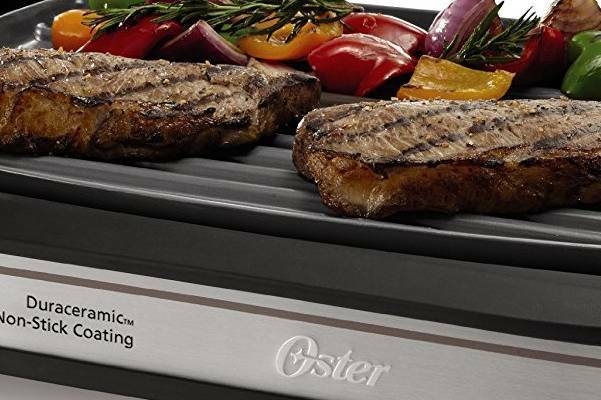 With its high-performance ceramic surface and a price tag to match, this Oster griddle is a premium option among home grilling appliances. It's a generously sized electric griddle, big enough to feed 3 or 4 or cook a batch of sized pancakes. You may want to leave it out on your counter top where guests can see it. It has a sleek, curved brushed steel finish that'll fit well with any contemporary or retro styled kitchen. The reversible plate is a neat way of offering both smooth and ridged tilted cooking surfaces. The ceramic surface performs extremely well, standing up well to use and abuse, and delivering even browning and temperature, thanks to the twin-coil heating elements. Some buyers found it too slow to reach temperature or were frustrated by the gap around the edge of the cooking surface. 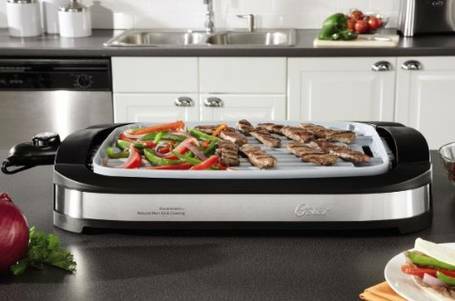 The Oster CKSTGR3007 ECO Duraceramic Reversible Griddle found favor among buyers as an indoor grill for winter, and a durable, great tasting alternative to using pans. 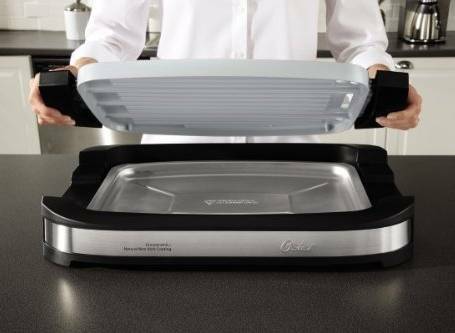 There were limits to what you can achieve with the Oster griddle, however. Despite the higher temperature available on the dial, it wouldn't sear and blacken steaks and burgers as a griddle pan as some electric griddles will, although it could achieve this effect with vegetables and fish. A large number of satisfied buyers didn't regret paying extra for a well-designed quality product with a durable and tough ceramic finish.